There is no question that heel pain is one of the most commonly presenting complaints to the podiatric practitioner. Although plantar heel pain seems to predominate in this category, we cannot overlook posterior heel pain as an important subset of heel pain syndrome. The main difficulty in treating patients who present with posterior heel pain is distinguishing the accurate etiology and diagnosis as many of these processes may closely resemble one other. Specifically, Haglund’s deformity and Achilles insertional calcific tendinosis often present with a posterior prominence, irritation with shoe gear and pain with activity. These two diagnoses are readily intertwined but yet quite distinct. Based on radiographic and magnetic resonance imaging (MRI) studies, Sundararajan and Wilde found a 25 percent frequency of Haglund’s deformity within the insertional Achilles tendinopathy population they studied.1 However, Kang and colleagues concluded that Haglund’s deformity was not indicative of insertional Achilles tendinitis and that removal of a posterosuperior prominence was not required in surgical treatment of calcific insertional tendinopathy.2 Clearly, one must understand the subtle distinguishing features of each syndrome to properly diagnose and treat each patient presenting with posterior heel pain. Insertional Achilles tendinosis most often is a result of mechanical overuse stress through the tendon complex. The increased pull of the tendon on its insertion on the posterior calcaneus may cause fibrosis and thickening of the tendon, and possibly fibrinoid and myxomatous degeneration. These processes can all lead to calcification within the tendon, creating a painful, palpable exostosis on the back of the heel.3 One key detail to consider is that pain associated with insertional tendonitis/tendinosis usually persists even without shoe wear. Clinical evaluation of the posterior heel is often notable for this prominence, which can extend both medially and laterally, corresponding to the broad insertion of the Achilles.4 In addition, there is usually thickening of the tendon itself, which leads to a bulbous appearance and feel on the tendon. There is typically tenderness with both range of motion of the ankle and with palpation diffusely across the posterior heel. Haglund’s deformity is characterized by a prominence at the posterosuperior aspect of the calcaneus resulting in irritation of the Achilles tendon, especially in patients wearing shoes with narrow or tight heel counters. Although very similar in presentation, there are small differences between these two diagnoses that one can distinguish with close consideration. Unlike insertional tendinosis, symptoms resulting from a true Haglund’s deformity tend to occur primarily with shoe gear and patients will most often relate that their symptoms subside when wearing backless shoes. In addition, Haglund’s deformity is less associated with more proximal tendon pathology than is insertional Achilles tendinosis. What does tend to be closely correlated with Haglund’s disease is retrocalcaneal bursitis. Pain due to a retrocalcaneal bursitis is a result of impingement of the retrocalcaneal bursa between the Achilles tendon and the calcaneus. Lohrer and Nauck investigated the prevalence of increased retrocalcaneal bursa pressures in patients with retrocalcaneal bursitis associated with Haglund’s deformity versus those patients diagnosed with Achilles tendinopathy.5 The authors found bursa pressures to be 40.4 mmHg greater in the retrocalcaneal bursitis group than in the Achilles tendinopathy group. One should also remember to evaluate the overall structure of the patient’s foot as Haglund’s deformity tends to occur more often in patients with a cavus type foot. As a result of this, the symptoms associated with a Haglund’s deformity tend to be localized more to the posterolateral aspect of the heel as opposed to insertional tendinosis, which can have a broader range across the heel. Radiographic examination is extremely helpful in discriminating between Haglund’s syndrome and Achilles insertional calcific tendinopathy. Bony spurring at the posterosuperior aspect of the calcaneus is almost exclusively present if calcific tendonitis is the culprit. More often than not, this is suggestive of calcifications within the tendon complex itself. Obtaining a calcaneal axial view will provide even further information regarding the degree of spurring. This view may be helpful in determining the extent of a Haglund’s deformity as well and will aid in incision planning if one is considering surgery. However, Malay claimed that a more accurate measure would take the calcaneal inclination angle into consideration.3 He stated that the combination of the calcaneal inclination angle with the Fowler and Phillip angle resulting in a measurement greater than 75 degrees is more indicative of a Haglund’s process. Lastly, one can use the parallel pitch lines to determine the prominence of the bursal projection. It is often wise to obtain MRI in patients presenting with calcific tendonitis, especially if one is considering surgery. It is vital to evaluate the integrity of the tendon itself as repair is almost always warranted with these types of procedures. Initial treatment for both Haglund’s syndrome and Achilles insertional calcific tendinopathy is similar and, especially in the early stages of the condition, can be effective in alleviating symptoms. Treatment options may include a reduction in activity, shoe wear modification for pressure reduction, a combination of heel lifts and/or orthotics, anti-inflammatories, and physical therapy. If the symptoms are particularly acute, a period of immobilization may be necessary prior to attempting the aforementioned modalities.4 However, if pain is recalcitrant to conservative management, surgery may be the inevitable scenario. There are multiple approaches to reflecting the Achilles tendon off the calcaneus.6 One may implement a straight linear incision with reflection of the tendon medially and laterally. Other options include a “U” shaped and inverted “V” shaped incision. One then debrides the tendon and removes any calcifications and scar tissue. If a Haglund’s deformity is present, the surgeon may resect this with either a sagittal saw and/or an osteotome. Smooth down all edges with a rasp to prevent any further irritation of the tendon. If one uses a straight lateral approach, reflect only the lateral slip of the Achilles tendon and then simply reattach it using one or two small bone anchors. If complete detachment is involved, reattachment of the tendon can occur in many different ways. It is common to use bone anchors to secure the Achilles back down to its attachment. Many manufacturers now make different systems that simplify the process and a number of them even offer bone anchors with a knotless system. Witt and Hyer describe a case series in which they used the Arthrex SutureBridge (Arthrex).7 This system uses four knotless bioabsorbable anchors along with a FiberWire suture (Arthrex) in a crisscross pattern to tightly adhere the tendon down to the calcaneal insertion. At a two-year follow-up, no Achilles tendon ruptures or device failures had occurred and patients were able to return to their daily activities. Similarly, Rigby and colleagues explain how this technique provides not only contact but actual pressure between the Achilles and the bone.8 In their review of 43 patients undergoing the procedure, patients began weightbearing at a mean of 10 days postoperatively. This ranged from patients beginning immediate protected weightbearing to those being kept non-weightbearing in a cast for a few weeks, which the authors determined by patients’ age, weight, comorbidities and activity level. The authors describe a decrease in Visual Analogue Scale scores from 6.8 preoperatively to 1.3 postoperatively. Forty-two of the 43 patients were able to return to activities or daily living, and 20 out of the 20 athletic patients were able to return to running. Augmentation of the Achilles tendon may also be necessary with either autologous tendon graft or an allograft.9 More recently, researchers have demonstrated the use of amniotic membrane to decrease scar tissue formation and aid in faster recovery. Conversely, authors have reported good results in the endoscopic treatment of Haglund’s deformity.11 Wu and colleagues describe a three-portal technique in which surgeons made a posterolateral portal about 5 cm proximal to the insertion, and then inserted a trocar and endoscope into the retrocalcaneal space. This established one posteromedial distal portal and another posterolateral distal portal. With the insertion of appropriate instrumentation, surgeons excised the retrocalcaneal bursa. They then used the single proximal portal to visualize the superior calcaneal prominence. Using a bur through the distal portals, the authors resected the posterosuperior prominence. They confirmed adequate removal of bone when impingement was no longer present with the ankle in a maximally dorsiflexed position. They also performed any necessary debridement of the Achilles tendon. Kondreddi and coworkers also found favorable results in 25 patients who had endoscopic decompression of retrocalcaneal bursitis along with resection of the Haglund’s deformity.12 As expected, those patients suffering from concomitant non-insertional tendinosis had poorer outcomes. Even more so, those presenting with calcific changes on radiographs had even less pain relief postoperatively in comparison to the two other subsets. The final surgical option, particularly to relieve the underlying cause of Haglund’s deformity, is performing a calcaneal osteotomy commonly known as the Keck and Kelly procedure. Those who promote this procedure attest that healing the wedge osteotomy is generally faster than healing the Achilles tendon if detachment is indicated.13 By utilizing a dorsally based wedge of the calcaneus, one can rotate the superior aspect of the posterior calcaneus anteriorly, resulting in decompression of the bursa along with reduction of the posterosuperior prominence. By using a lateral incision for this procedure, surgeons can preserve the Achilles attachment. Sella and colleagues reported good results in 13 out of 16 patients who had a calcaneal osteotomy for Haglund’s deformity.14 They also concluded that an osteotomy angle of 49 degrees should be present in order to attain a favorable result. While similar in presentation, Achilles insertional calcific tendinosis and Haglund’s deformity are two truly distinct entities with unique etiologies and defined surgical treatment options. Although the two disease processes we discussed above are by far the most frequently occurring, one cannot neglect the less obvious explanations for posterior heel pain. These include certain neurologic etiologies, rheumatic diseases and other orthopedic problems such as flexor hallucis longus tendonitis and os trigonum syndrome. It is also essential to consider other contributing factors to the patient’s symptoms. For example, evaluating the patient for an equinus deformity is an important component of the physical exam. A tightened posterior heel cord can be an underlying cause of Achilles tendinopathy and can exacerbate both this and a Haglund’s deformity. An Achilles or gastrocnemius lengthening may very well be indicated and if one does not perform this procedure, it can lead to subpar outcomes. However, if the practitioner does a comprehensive physical exam, taking overall foot type and structure into consideration, he or she can implement an appropriate treatment plan with a positive outcome for the patient. 1. Sundararajan PP, Wilde TS. Radiographic, clinical, and magnetic resonance imaging analysis of insertional Achilles tendinopathy. J Foot Ankle Surg. 2014; 53(2):147-151. 2. Kang S, Thordarson DB, Charlton TP. Insertional Achilles tendinitis and Haglund’s deformity. Foot Ankle Int. 2012; 33(6):487-491. 3. Malay DS. Heel surgery. In (Banks AS, et al, eds) McGlamry’s Comprehensive Textbook of Foot and Ankle Surgery, volume 1, third edition. Lippincott, Williams, and Wilkins, Philadelphia, 2001, pp. 441-463. 4. Thomas JL, Christensen JC, Kravitz SR, et al. The diagnosis and treatment of heel pain: A clinical practice guideline- revision 2010. J Foot Ankle Surg. 2010; 49(3Suppl):S1-S19. 5. Lohrer H, Nauck T. Retrocalcaneal bursitis but not Achilles tendinopathy is characterized by increased pressure in the retrocalcaneal bursa. Clinical Biomechanics. 2014; 29(3):283-288. 6. Bouche RT, McInnes B. Posterior heel pain: Haglund’s deformity, pump-bump deformity, and Achilles insertional calcific tendinosis. 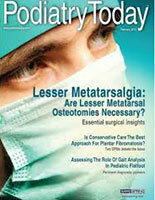 In (Chang TJ, ed) Master Techniques in Podiatric Surgery. Lippincott Williams and Wilkins, Philadelphia, 2005, pp. 265-277. 7. Witt BL, Hyer CF. Achilles tendon reattachment after surgical treatment of insertional tendinosis using the suture bridge technique: a case series. J Foot Ankle Surg. 2012; 51(4):487-493. 8. Rigby RB, Cottom JM, Vora A. Early weightbearing using Achilles Suture Bridge technique for insertional Achilles tendinosis: a review of 43 patients. J Foot Ankle Surg. 2013; 52(5):575-579. 9. Zelen CM, Poka A, Andrews J. Prospective, randomized, blinded, comparative study of injectable micronized dehydrated amniotic/chorionic membrane allograft for plantar fasciitis: a feasibility study. Foot Ankle Int. 2013; 34(10):1332-9. 10. Thermann H, Benetos IS, Panelli C, et al. Endoscopic treatment of chronic mid–portion Achilles tendinopathy: novel technique with short-term results. Knee Surg Sports Traumatol Arthrosc. 2009; 17(10):1264-1269. 11. Wu Z, Hua Y, Chen S. Endoscopic treatment of Haglund’s syndrome with a three portal technique. Int Orth. 2012; 36(8):1623-1627. 12. Kondreddi V, Gopal RK, Yalamanchili RK. Outcomes of endoscopic decompression of retrocalcaneal bursitis. Indian J Orthop. 2012; 46(6):659-663. 13. Boffeli TJ, Peterson MC. The Keck and Kelly wedge calcaneal osteotomy for Haglund’s deformity: A technique for reproducible results. J Foot Ankle Surg. 2012; 51(3):398-401. Sella EJ, Caminear DS, McLarney EA. Haglund’s syndrome. J Foot Ankle Surg. 1998; 37(2):110-114.